Come Tandem Paragliding with professional Swiss licensed tandem pilot, Glenn Parsons. Glenn has been living in Zermatt since 1997. As a former professional skier, has always had a passion for the mountains. It was a natural step for him to take to the skies for a view of our amazing terrain from above. Flying around the Zermatt region, surrounded by 4000m peaks, including the majestic Matterhorn, is truly breathtaking. Glenn has been paragliding in Zermatt for more than a decade. His local knowledge will make your flight even more memorable. 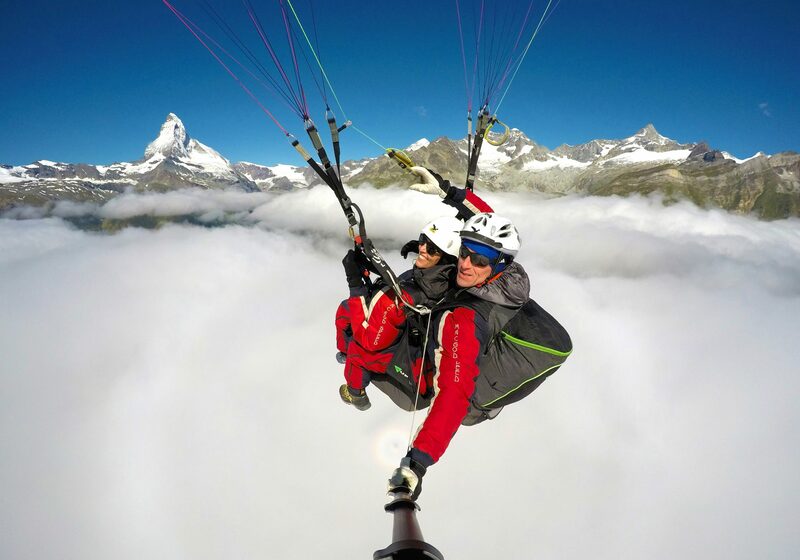 Tandem Flights from Rothorn, Blauherd, Riffelberg, Gornergrat and Klein Matterhorn are available through out the year, each one offering an unimaginable view of the Matterhorn and the picturesque township of Zermatt.